The CME6005 is a BiCMOS integrated straight through receiver with build in very high sensitivity for the time signal transmitted from WWVB, DCF77, JJY, MSF and HBG. 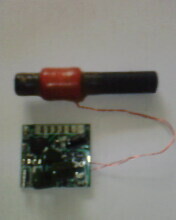 The receiver is prepared for single-and dual band (by using additional capacitor matching pin) reception. Integrated functions as stand by mode, complementary output stages and hold mode function offer features for universal applications. To give our customer the possibility to check the performance of our new Receiver IC CME8000 we have designed a combination of a demo and Test board. To demonstrate all features a complete clock programming is done. Including temperature and humidity measurement. The programming contents all possible features including country scanning for world wide solutions or dual band reception for Japan. Reception time can be defined, duration of reception can be defined, last succesful reception is shown, contents of the timestring can be selected. For the programming we have used the S1C666 flash type of our co-developed CPU from EPSON S1C636C4. The flash can be reprogrammed via a serial interface. The connector is already installed on our board. 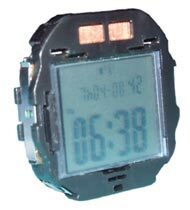 The CM-DM-80/0X is a digital watch module with various features and receives multiple frequencies (40kHz, 60kHz, 77.5kHz). 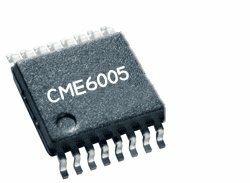 Using our CME8000 as receiver IC, this module demonstrates the most state-of-the-art RC technology. Based on this module as a reference, we offer individual software-and module solutions with features according to customers needs and requirements.